Hydroquinone For Acne Scars And Hyperpigmentation - Does It Really Work? Hydroquinone For Acne Scars And Hyperpigmentation – Does It Really Work? If you have acne, you may also hold the firm belief that one of the worst things about breakouts is the scars they leave behind. Battling current pimples is one thing, but trying to rid yourself of the scarification that remains is a whole different struggle. Indeed, it turns out that monthly, tens of thousands of Americans look for the answer to this conundrum on-line. They not only seek help for dissolving their zit scars but also for doing away with age spots, etc. One of the main suggested solutions that they uncover is hydroquinone. Using hydroquinone to fade away your scarring may work on your skin but not with any redness from any active breakouts. Indeed, it is a very controversial solution – many curse it as a product which only causes further problems. However, those that have benefited from it praise it like no other. Let us explore the controversy so that you can make your own decision as to what you will use to make your complexion shine again. Basically, hydroquinone is a chemical which serves to subdue the melanin in your system. Melanin is the element which creates, and contributes to your skin color. If you have been spending a lot of time in the sun’s light or have acne, melasma, or even freckles, you may be advised to use hydroquinone. This has the potential of lightening your skin and evening out its complexion. However, this does not always turn out to be a solution; more than that – it can often cause more harm than good. Read on to find out some of hydroquinone’s possible negative effects. As mentioned, hydroquinone represents a chemical and while that doesn’t make it any less potent in improving your skin, it does mean that there are a few things to keep in mind when using it. To be sure, there are many risks that come with using hydroquinone. First and foremost, you may find yourself to actually be allergic to this ingredient. Indeed, if you happen to develop an allergy to it, it will likely be an extreme one – including stinging and burning, possible hives, and even swelling of the respiratory system and an inability to breathe properly. For that reason, you should make sure to never use hydroquinone without being advised to do so by a specialist. Moreover, while it may seem logical to use this product after sun exposure, it can actually make you more sensitive to the sun’s rays. Certainly, make sure not to apply hydroquinone to your skin if you have recently spent a considerable amount of time in the outdoors or have any sort of burn or skin inflammation. Never use it before going out into the sun, either! Not only can this make you feel physically unwell, but it can even worsen your skin condition. As mentioned, it is important to keep in mind that hydroquinone is a chemical. This means that the amounts in which you use it should be precisely measured, as using it in high doses can bring about toxic reactions. These can include an increased sensitivity to carcinogenic growths, as well as damage caused by its mercury content. If your reaction isn’t as severe, you might still find yourself facing dizziness and nausea, seizures or skin discoloration. This means that while you are using the chemical to lighten your skin, you might actually end up darkening it or intensifying the coloring of some of its areas. The darker you are, the more likely you are to experience ochronosis discoloration due to this product. This could very well mean that your scars might worsen from using hydroquinone. Indeed, each individual may react differently to the chemical, so it is absolutely crucial to obtain a doctor’s opinion before investing too much effort into using hydroquinone. However, products like Ambi Fade Cream, which incorporates a mere 2% of the ingredient, have proven to be helpful for many people. One interesting strategy that we have encountered is to lather some of the cream onto scars and to position a layer of clear tape on top (in order to make sure that the product actually stays on your skin throughout the whole night). Apparently, this method has the potential to make any spots on your skin fade away quickly and efficiently. Other tips for doing away with acne scars frequently focus on exfoliation. 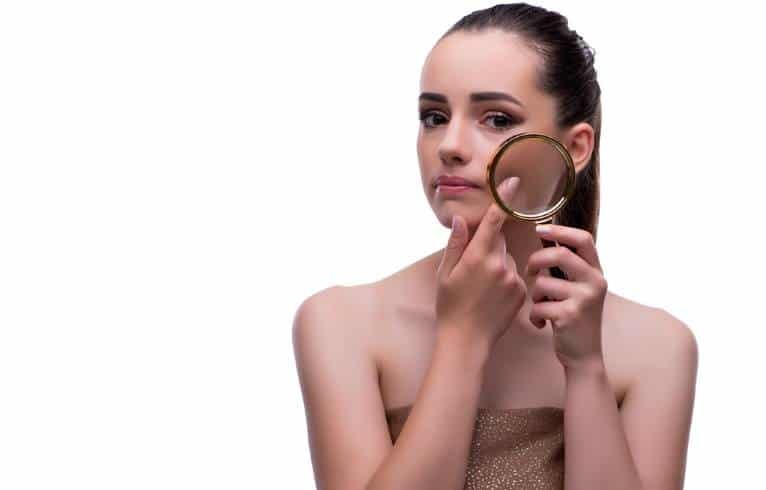 It only seems logical that if you are trying to rid yourself of indentations on the surface of your skin, you would start by reshaping your complexion and by scrubbing away its old, dried surface. Use special scrubs, masks, cloths or even brushes and enjoy an oil-and-dirt-free skin that is no longer abundant in dried cells. Another helpful tip to keep in mind is that Vitamin C is irreplaceable when it comes to combating scars. Opt for Vitamin C serum if you are craving a smooth, glossy, sun-kissed-looking complexion. Apply it at night and let it work its magic while you peacefully sleep in your bed. Make sure to not face direct sunlight after application. Vitamin D3 is another crucial aide against scars – especially if you naturally lack a high level of it. Generally, this supplement is irreplaceable in terms of both your skin, as well as your teeth, bones, muscles, and even your immune system. You certainly don’t have to invest in a major product to get your fix of Vitamin D3. You can simply obtain it from a drugstore product like the Rainbow Light Berry D-Licious Vitamin D3. Indeed, it is especially important to ingest additional Vitamin D in this way, if you are already conscientiously protecting yourself against the sun by completely staying out of it. Probiotics are yet another wonderful element which can immensely benefit your skin. Probiotics have the potential of masterfully clearing up your complexion, as well as generally benefiting your system without any side effects. Our go-to product is the Good Belly Probiotics juice. Speaking of ingredients that you can ingest in order to improve your skin, make sure to check how much gluten you are taking in per day. Indeed, it is pretty much common knowledge that carbohydrates and sugar can harm your appearance, as well as your weight, but gluten is another important factor in maintaining good skin. You might also want to make sure that your acne isn’t simply caused by your hormones. While this may sound more serious than it should, it actually makes your breakouts predictable. A doctor could thus easily check your hormones and verify which components you are lacking. Last but not least, it is time for the ever-green advice – never skip sunscreen! This is the case no matter what condition your skin is in, but it is especially important if you are using hydroquinone. It makes you especially sensitive to the sun’s rays and it specifically necessitates an SPF of 70 or so. Remember to apply sunscreen at all times, even if you are simply driving in your car. In fact, if you are a driver, you might want to invest in a sun shield. Otherwise, make sure to opt for make up that already contains a certain level of SPF. This is a convenient way to protect yourself against the sun without having to buy a bunch of different face products. While it may turn out that hydroquinone is the product for you, it seems to not work for most people. In fact, various countries have seen to it that the chemical’s usage is banned on their territory. It may improve your skin, but it may also worsen it. Given this risk, we recommend having an extensive talk with your doctor before committing to it. Conversely, opt for safer ingredients, such as vitamins and dimethicone silicone.